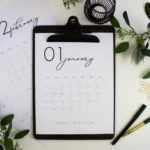 Organization is on everyone’s mind at the beginning of the new year. I think we all accumulate so much over the holidays that we have a real urge to purge. And then there’s the fact that we take all of our Christmas decor down, see our space in a whole new clean light, and decide we want the rest of the house to get freshened up too. 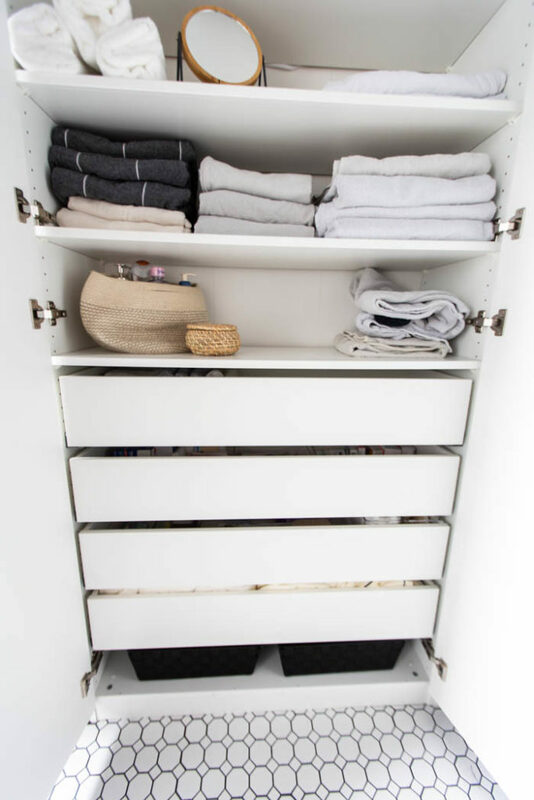 Whatever your reason, an organized linen closet is likely on that “wish” list. 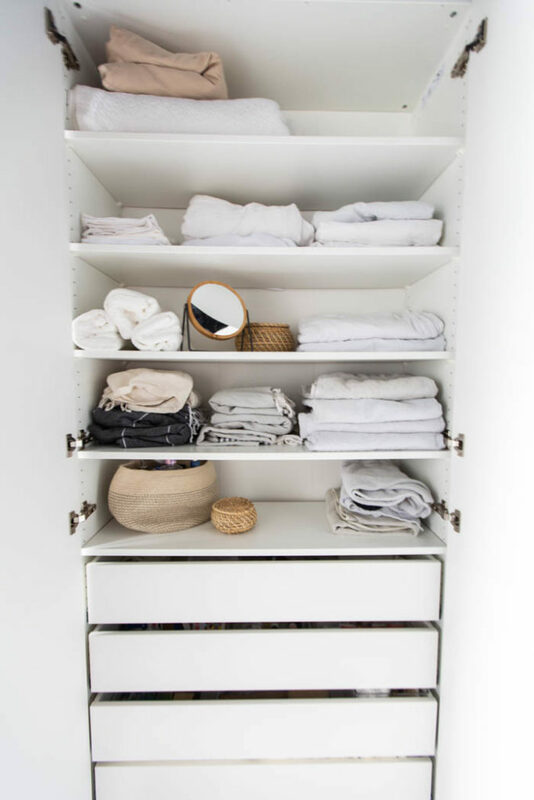 Our linen closet has been an absolute mess since the day we moved in this home, and it’s such a relief to finally have it clean and organized. The thing about organizing a space, and I mean reaaaaally organizing it. Is that once everything has a home, it’s so easy to maintain. All of the work is done up front with the purging, sorting, and labelling. Have you ever had the experience of trying to organize the linen closet, and then somehow a week later nothing fits in their spots anymore? Towels and sheets seem to have popped out of the woodwork just to ruin all of your hard work? 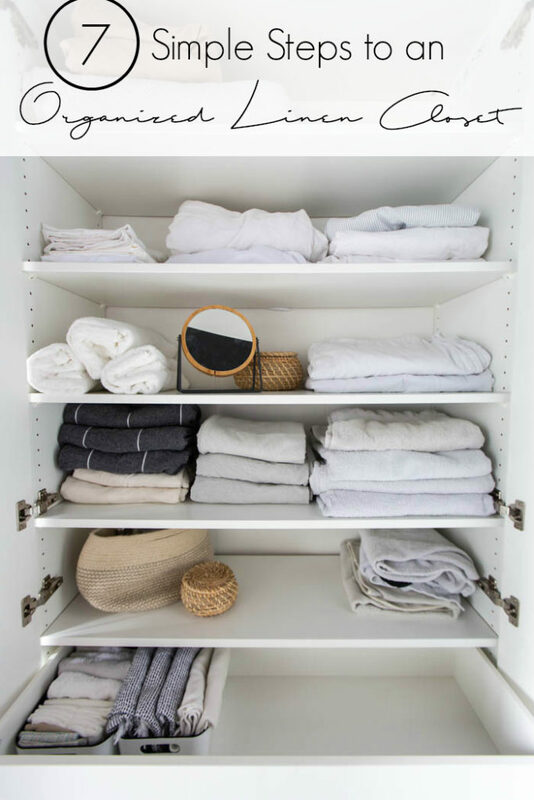 Today I’m sharing my best seven tips to maintaining an organized linen closet, including how to avoid all of that organization falling apart a week later! Before you start purging towels and sheets, my suggestion is to wash everything and bring it all together. That way you know exactly how many of each item you have. I’ve always been a purger, so it’s not hard for me to get rid of items I don’t need, but I do recognize that it’s hard for some! But we all must agree that no one needs 15 sheet sets in their home, right? We have two sets for each bed, that way even if we have a bunch of guest on pullout couches and sofas, we still have enough for everyone. When it comes to towels, facecloths, etc. I generally count how much we go through in a week, and keep double that. If half of it is sitting in the laundry, we should still have enough. 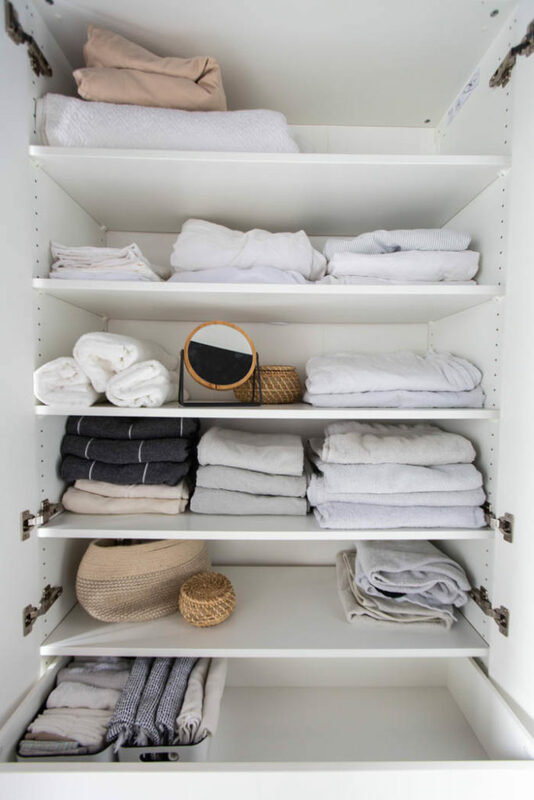 You can always through a couple extra in there for good measure, but moderation is key to an organized linen closet. Throw away or give away all of the scratchy old towels, or the ones you don’t use regularly anymore. They are just taking up valuable real-estate. Have you ever had someone else “help” with laundry, and it resulted in your re-folding everything? 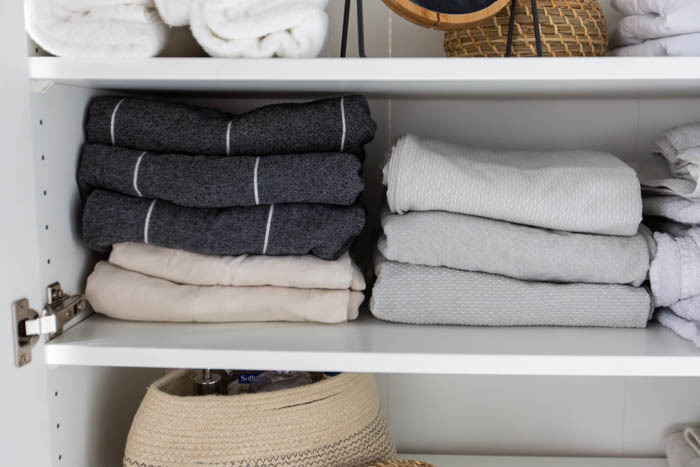 The best way to keep your linen closet looking clean is to have one easy method of folding that can be used consistently for all of your linens. Personally, I’ve chosen to use the Marie Kondo method. If you haven’t heard of Marie Kondo, she’s the author of the book, The Life-Changing Magic of Tidying Up. 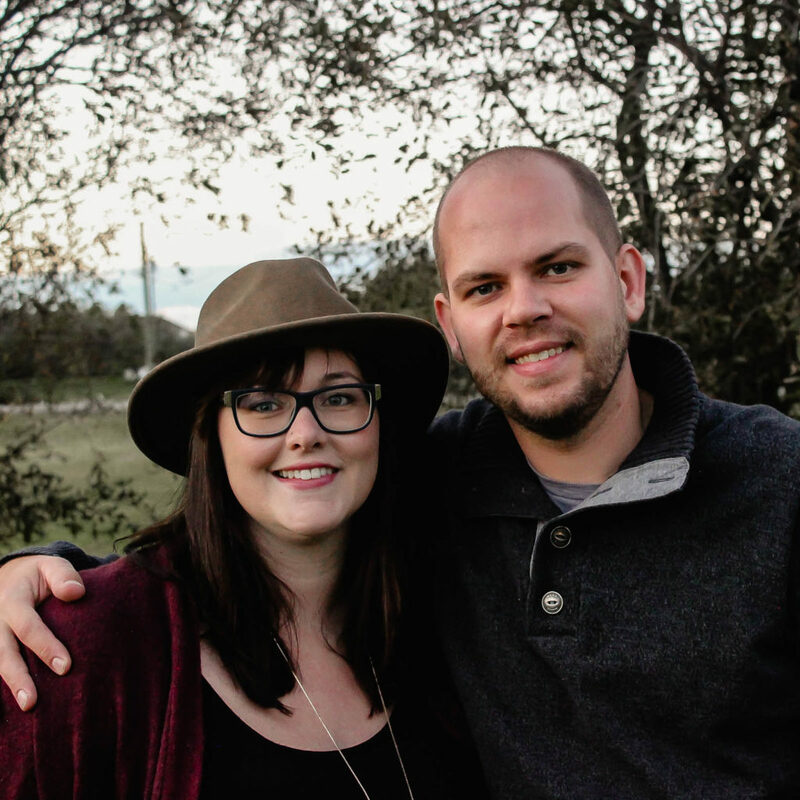 Her folding methods were life-changing for me! They’re easy to teach your children, and easy to maintain. 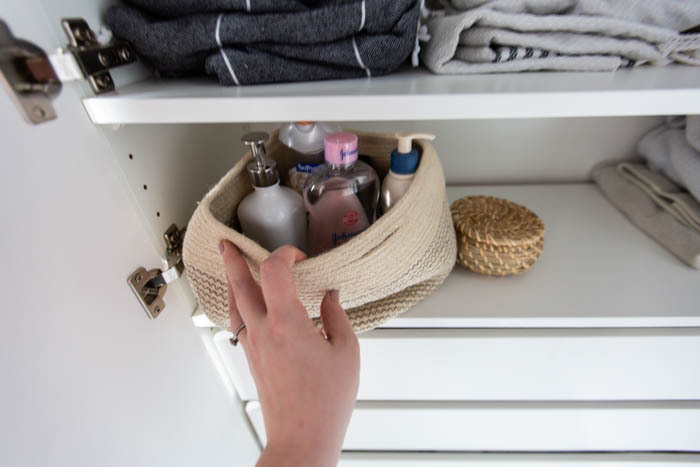 PLUS, it allows you to store items vertically if you have bins, baskets or shelves that allow that. Here’s a video showing how to fold towels, and here’s one showing how to fold a fitted sheet. Whenever you feel the need to replace your old towels, I highly recommend cotton turkish towels. They are lightweight, very easy to fold, compact, and beautiful. 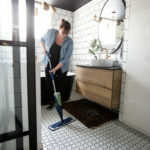 They do the same job as a traditional fluffy towel and are still comfortable to use on a daily basis, but they are much easier to fit into an organized linen closet, and they come in a ton of beautiful designs. 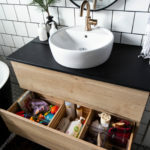 Space-saving and pretty? 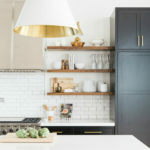 Sign me up for turkish towels! 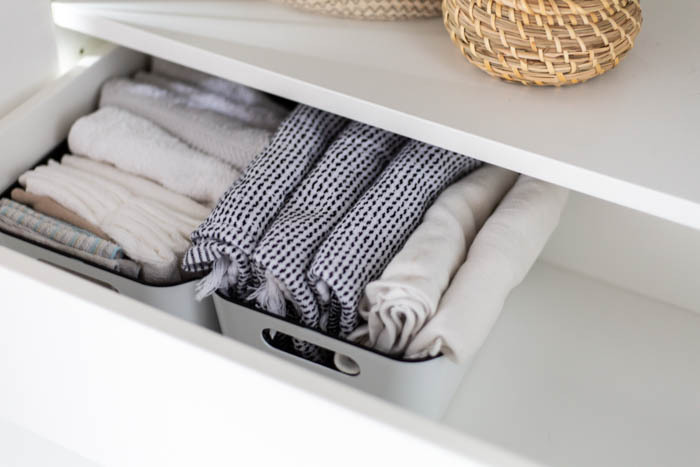 When it comes to maintaining an organized linen closet, the best thing you can do is break down your piles, baskets or bins into very specific groups. The easiest way to mess up an organized closet is by searching for kids sheet, and having to pull out a bunch of sheets to find it. Break it down into groups such as “Kids top sheets”, “Kids fitted sheets”, “beach towels”, “Guest towels”, etc. etc. You obviously don’t want to be reaching up to the top shelves every day for a new hand towel. 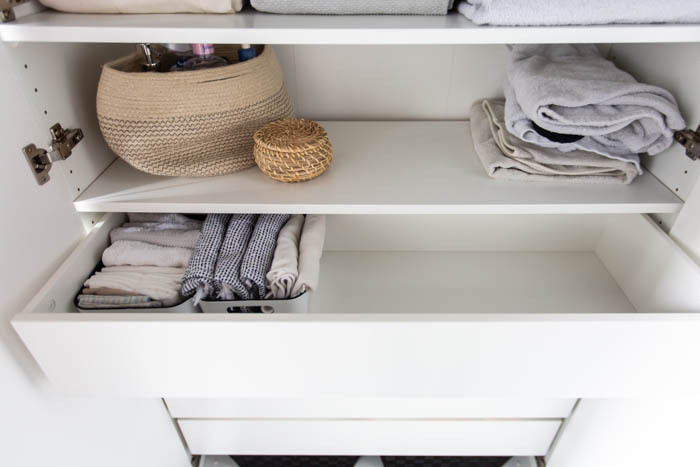 Keep the items you use most, right where you can see then as soon as you open the closet. Our closet stores guest blankets and coverlets at the very top of the closet, followed by extra sheets, etc. etc. The lowest drawer stores our children’s towel so that they can easily access them if they need to as well. I *think* is goes without saying that no one wants to see any feminine hygiene products on display. Baskets and bins are made to hide these, and pretty ones are easily available! There are also likely some “extras” that you need to store in your closet too. We have a few product bottles that don’t really “fit” anywhere else. A beautiful basket is the perfect way to store them without anyone needing to see them. This is the one step I haven’t gotten to yet in all of our linen closet organization, but when it comes to helping my family maintain my organization, you bet I will be labeling! 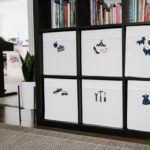 You can add words right onto your shelves, or sort everything into baskets or bins and label those with stickers or pretty tags. I promise you that my linen closet did not get this cohesive overnight. I gradually bought new towels and sheets to replace old ones, and eventually they all matched beautifully. 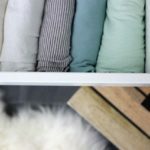 I hope this helps you organize your own linen cabinet with ease! 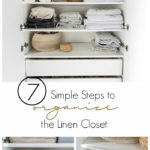 If you follow these quick seven tips, I’m confident that you’ll have a beautifully organized linen closet that will be the envy of every friend or family member that opens it up! 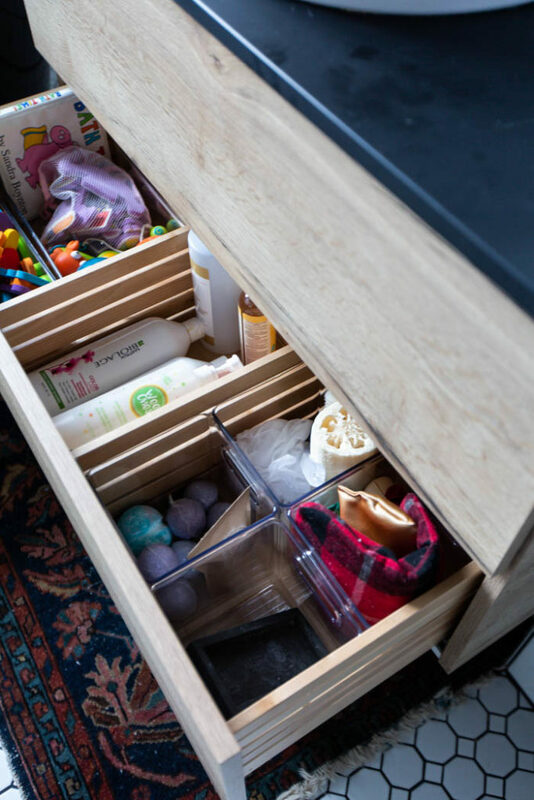 Try getting your DRAWERS ORGANIZED now too with these quick tips!